As the veteran French Mixed Martial Arts (MMA) boxer Arnaud Lepont defeated the Filipino finalist Richard Corminal at the One Championship organized at the end of 2017 in Singapore, the Frenchman held up the Vietnamese flag to celebrate his victory. Lepont, 37, began his career as a professional MMA boxer 13 years ago, holding a record of 12 wins and five defeats on the ring. He started to learn karate when he turned five in his home country, France. Since practicing the Japanese martial arts, Lepont has also begun to love and learn about Asian cultures and other Asian martial arts. “To me, the East is full of mysteries waiting to be explored,” Lepont said. Lepont first visited Vietnam in 2010, traveling to Malaysia and Thailand to work before coming back to Vietnam in 2014 to teach at a martial arts center in Ho Chi Minh City. The French boxer is married and has a son in Vietnam. “I have been living for many years in Vietnam and currently has a stable job and a family here,” Lepont said. 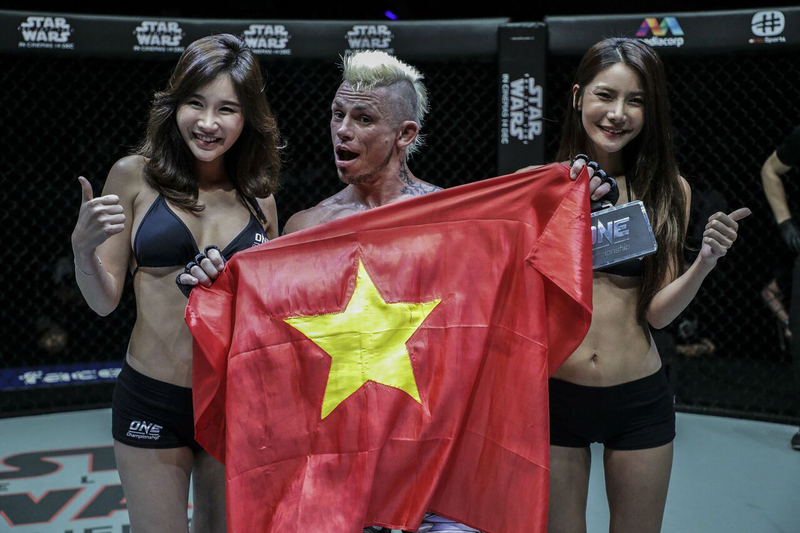 “Although I was not born in Vietnam, I always feel like I am a Vietnamese and I would like to become a Vietnamese citizen in the future,” the Frenchman explained the reason behind his holding up the Vietnamese flag at the One Championship last year. When Lepont was young, he suffered from attention deficit hyperactivity disorder, a mental problem in children and teens, and he was sent to learn karate by his father, which somehow helped treat his medical problem. “When my son grows up, I will also let him learn Asian martial arts,” Lepont said. The French MMA boxer has spent time learning Vovinam and other traditional martial arts of Vietnam. Lepont hoped that MMA fights will soon be legalized in Vietnam, as there are an increasing number of qualified practitioners of this particular martial arts form in this country. Although reaching a retirement age for a martial arts professional, Lepont never ceases learning and in 2017 he obtained a black belt in jiu-jitsu, a Brazilian martial arts genre similar to judo. Besides his love for martial arts, the French boxer has spent time learning Vietnamese and how to cook Vietnam’s traditional dishes.